This is a unique, flavour packed vegetarian recipe. Brussel sprouts are small leafy green buds resembles like miniature cabbage in appearance. The buds are exceptionally rich in protein, dietary fiber, vitamins, minerals and antioxidants, which makes wonders to get rid of many health troubles. According to the health and nutrition site 1 cup of brussel sprouts roasted with chopped onion, olive oil contains enough vitamin c, high in fiber, low in fat, low in sodium. Pre-heat the oven at 200deg c line and grease the baking tray. Drain the tofu and use your palms to gently squeeze out some of the water. Slice the tofu and use your palms to gently squeeze out some of the water transfer it on a paper / kitchen towel fold the tissue and Place some heavy on top to help the tofu drain. Transfer the drained tofu to a cutting board. Slice it to cubes. Toss sprouts, tofu and onion in a bowl with olive oil and salt. Spread it on the lined baking tray in a single layer and bake it for 20-25mins / until browned, tossing them over at the midway point to ensure even cooking. Transfer it to the bowl, add olive oil, ground pepper mix and serve. You can even use low fat paneer/cottage cheese instead of tofu. I just topped it with chilli sauce while serving for more spicy option. 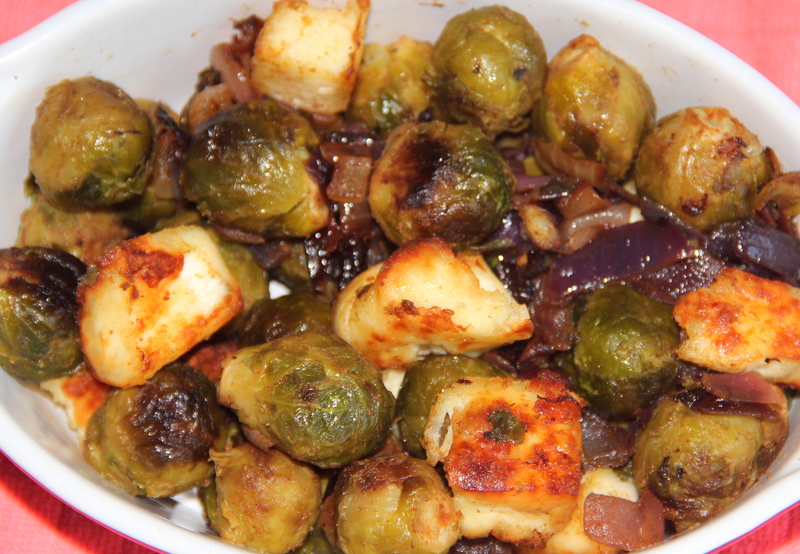 Posted on June 12, 2014, in International, Salad/Wraps, Soups, Salad and Wraps, Vegan and tagged Brussel sprouts, Chitras healthy kitchen, drchdietfood, Roasted Tofu, Tofu, Vegan friendly. Bookmark the permalink. 2 Comments. I love the look of this. It’s on my ‘must try’ list now.